It's been a busy Spring and weve just uploaded some recent pictures of completed projects. LEFT: Sea Ranch custom project featuring antique glazing and modified Shaker style design. Were really proud of this project! 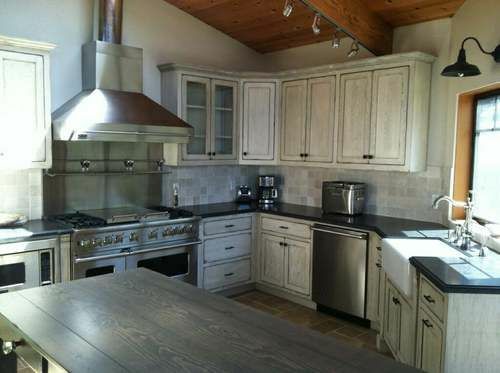 MORE: Italian inspited designs on this Martinez kitchen! Go to our Projects & Photos page and click on the updated photo gallery for more project and shop photos! You can always send us our own photos (We love I-Phone and Smart Phone images) so that we can work up a bid or understand what you like! This months Video Blog is a little information on the benefits of using us. Specifically, I help coordinate the project, with my ability to work with the other tradespeople on a job. The result: Electrical and plumbing is where it's supposed to be and the cabinets are hung where there supposed to be, with no dangling wires, sockets or missing plumbing fixtures. (You laugh...unitl it happens)! Keep supporting your favorite custom cabinet design shop and talk us up...we like referalls. Want to give us an endorsement or testimonial....we want to hear from you. We want to send our Digital Manager to see you and capture on HD for an upcoming testimonial video! Happy New Year 2012 from BC Cabinets...Thanks for your support ! July News-Blog...New website launch and Social Media links!